I received this cactus from Bomi, my maternal grandmother, in 2002. She’d raised it from cuttings from one of her older plants. I suspect she had been doing this for years and may have gotten her original plant from her mother. She told me to water it once a week by filling the saucer under the flower pot with “standing” water. As soon as she watered he plants she would fill the watering can and let it stand at least a day before using it. Once a month I was to add a few grains of engrais rose, a fertilizer for strong growth and abundant flowering, to the saucer. The pink colored grains would dissolve and feed the plant as it was watered. She didn’t tell me the secret to getting it to flower. But as you can see by my photos I haven’t had any problems with it blooming. Sometime after Bomi died in 2005 the cactus began making one darker pink flower. Over the years one became two and two became three. I don’t have any idea why the plant is doing this or if it’s normal. My mother also has one of Bomi’s cacti. She puts hers outside during the summer and doesn’t worry about windy weather breaking off branches of the plant. She says this keeps it from getting too big. We began doing the same with ours. One time it was blown over the side railing of the porch by high winds and a large piece was broken off. It looked a little lopsided so I stuck a few of the broken off pieces into the soil where the piece had broken off. Surprisingly they took and today the cactus is no longer lopsided. It has only been re-potted once since we’ve had it and pssst hasn’t had fertilizer in ages. After the success of my planting the cuttings next to the “mother” plant I tried planting six cuttings in a small flowerpot. The “cuttings” were branches that had been broken or knocked off. All six took and the new plant flowered about three years later. We keep the old and new plants outside until just before the first frost. They do not fail to begin budding a week after being moved indoors. 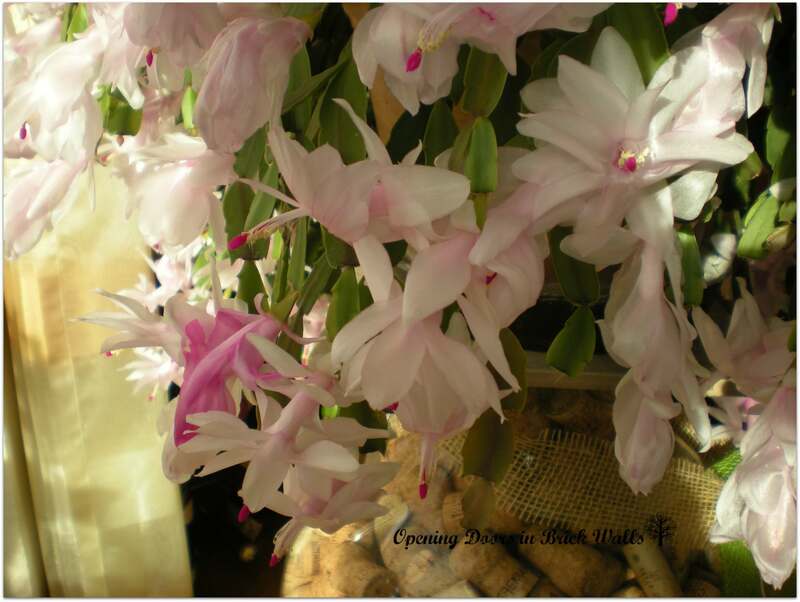 Although we call the older one Bomi’s Christmas Cactus it usually blooms first around Thanksgiving and twice more before the spring, reminding us of her. My Blogger_lu blogging friend Claudine shared her grandmother’s geraniums on her blog yesterday. The over 40 years old geraniums’ future are insured by her husband, also know as Monsieur Merlanne, who plants cuttings each August. Jeanne Bryan Insalaco of Everyone Has A Story suggested doing posts on heirlooms in a discussion in the Genealogy Bloggers Facebook group and wrote Now Where Did I Put That? 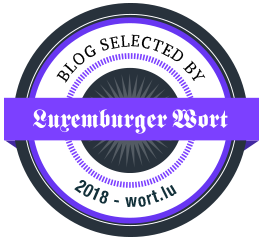 Several bloggers have taken her up on the challenge to write about their heirlooms and we hope more will follow our lead. Amy Johnson Crow’s 52 Ancestors in 52 Weeks theme for 2015 Week 24 was Heirlooms. 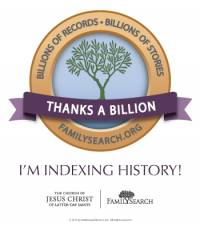 Visit her 52 Ancestors Challenge 2015: Week 24 Recap for the links to more posts in the comments. I love your idea to share Heirloom stories. 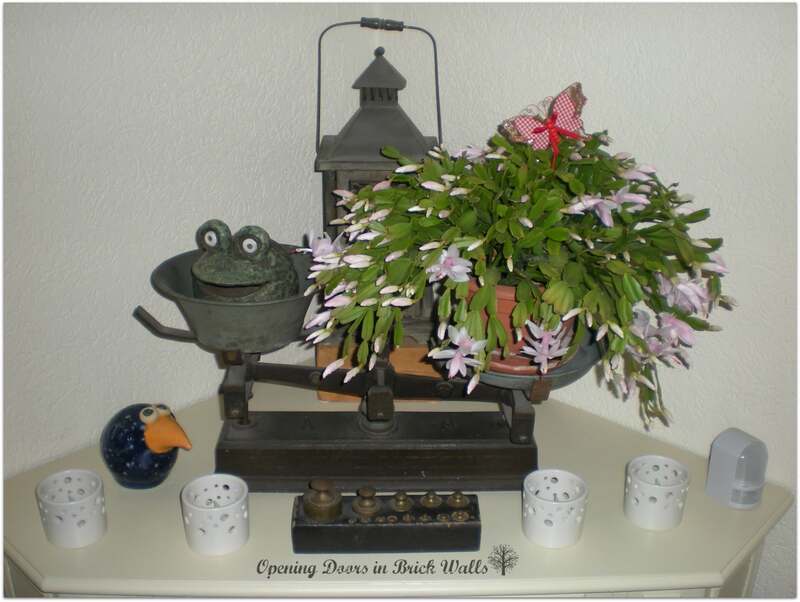 Our Christmas Cactus has begun blooming a few days ago. I got the plant from my father’s old cactus and so also this plant wanders from generation to generation. Isn’t it wonderful to have these memories! Thank you for stopping in. From a person who lives surrounded by cactus, Bomi’s plant is gorgeous! What a terrific way to remember her. I have never seen anything like that! What a gorgeous plant, and what a wonderful way to remember your grandmother and keep her alive. Thank you Amy. It’s quite easy to care for. That is the most beautiful cactus plan I’ve ever seen! What kind is it?? 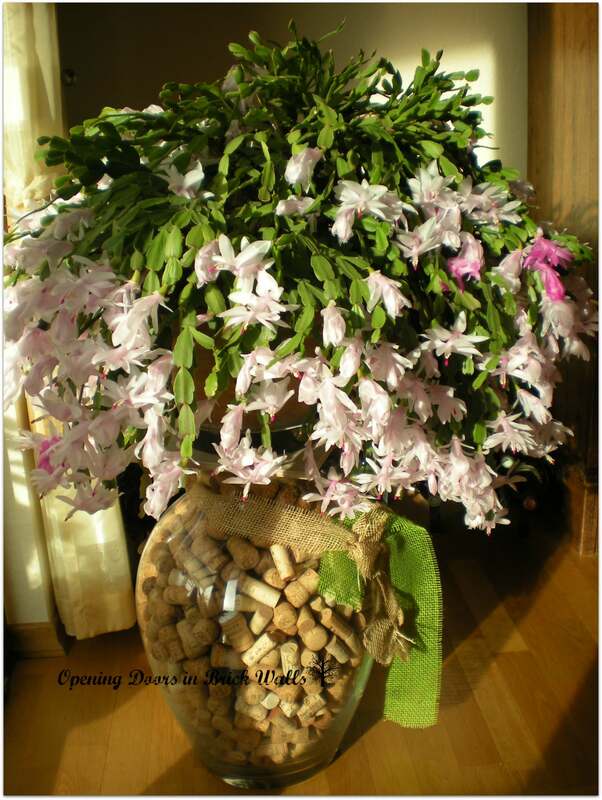 Thank you.I believe it is a schlumbergera bridgesii. I love this post, Cathy. 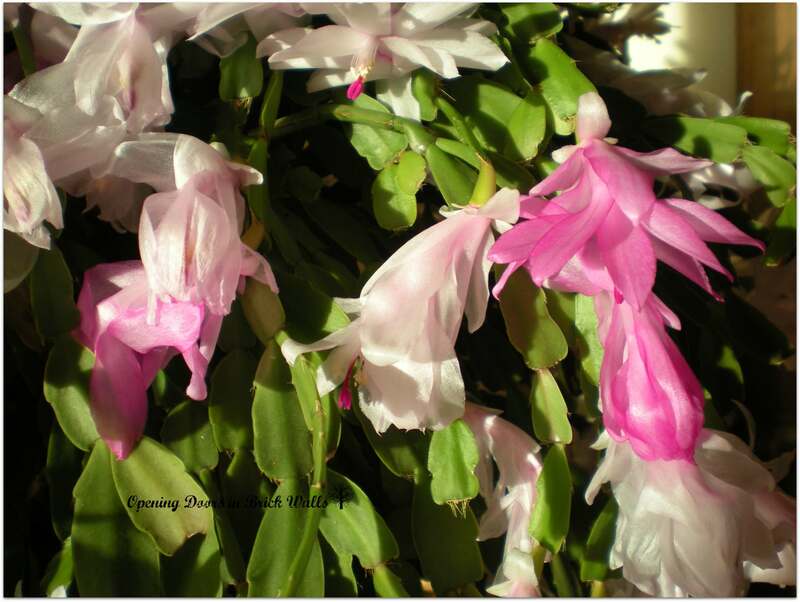 Now I know how to care for Christmas cactus, and I may get one in a few months. My Mother had several of these plants, but when she died, I had no way to take them with me, from Virginia, back to Texas. Thank you Paula. They aren’t too hard to care for. The most important part of the care, according to my grandmother, is to not use water straight out of the spigot – it has to be room temperature. Loved your cactus heirloom story; I also have a plant that originally came from my grandparents farm and when it blooms it reminds me of good times. I’ll be sharing it later on. Love reading all the heirloom stories told. It’s a beautiful plant. I don’t keep any plants inside anymore – never remember to water them.